From watching flying machines in Taiwan Day 1037, I boarded Utopia's water vehicle to reach Orchid Island. It is locally known as Lanyu. The Yami people live on this tiny piece of land and I had always been fascinated to visit this place because they share 60% to 75% of their words to the Ivatans of the Batanes Islands in the Philippines. How did these happen? Were they part of one great Utopian society a long time ago? I was hopeful that I could find the answers here in Lanyu. My Taitung - Orchid Island roundtrip ticket. I asked help from my hostel in Taitung City to buy me a ticket. Prospective visitors to Lanyu can also send a message to the Facebook page of EZboat to inquire about the ferry schedules and the available tickets. For my case, since I was only going alone, it was easy for my hostel owner to insert me in the passenger list. For group visitors going to the island without ticket reservations, it might be difficult to get seats. Taitung Fugang Harbor. I showed my identification card to the ticket office to confirm my reservation. They also asked for my cellphone number so they call me in case of any changes in the departure times of the ferry at Orchid Island. The ferry that brought me to Orchid Island. Before I boarded the boat, I first went to a store inside the harbor to buy anti-motion sickness medicine. I just showed this photo (link) to make things easier. Life jackets are placed under the seats. Arriving in Lanyu, I immediately saw its mountains. Lanyu port. I had already arranged my transportation to my hostel before arriving on the island. Thanks to Airbnb! I found a budget hostel where I decided to stay for three days. I planned a lot of activities and my first agenda was to explore the island by cycling along its 30-kilometer seaside road. My host provided a sturdy mountain bike for a price of NTD 250 for 24 hours. I tested the bike first and after I found that it was ok I immediately started my adventure. It was a hot afternoon and it was a good thing that I brought a sunblock lotion. Being close to the Philippines, the climate here in Orchid Island is more similar to my country than the weather in Taiwan. It was described as a tropical island but also experiences the same chilling wind of the winter season much like the same in Batanes which is said to experience the four seasons of the year. Gentle slopes of mountains, fantastic cliffs and the sound of crashing waves welcomed me in a place called the Green Green Grassland. I was the only here and I took my time to take photos. The green color of the grass made it suitable for providing food for grazing animals. At a near distance was a small piece of land on the sea and they call it Little Lanyu Island or Xiao Lanyu. Go underwater and you will find underwater mountains connecting Orchid Island to the Batanes Islands of the Philippines. Sounds great! I was so close to home but still so far away. My first glance of the nuclear waste storage facility. Colorful murals decorate its walls. Video presentation on how the nuclear wastes are processed and stored. Nuclear wastes are mixed with cement and poured into these large cans which are then placed in the green shelters outside. The radioactive cans are stored here. The gate of Taipower Lanyu Nuclear Waste Storage Field. Visitors must present their passport or ARC to get inside. Outside the nuclear waste storage facility. After taking this photo, I received a call from the ticket office in Fugang Port in the island of Taiwan. A typhoon was fast approaching Taiwan and the ferry services would be suspended in the afternoon so I have to return to Taiwan island the next day. The wild goats in Lanyu have a fascinating ability to climb the rocks. Lanyu Island was a real Utopia but beware! There is an alarming danger inside the island. Nuclear wastes coming from Taiwan's hospitals, industries, academe and other sources are being transported here and stored in yellow cylindrical cans in a facility called the Taipower Lanyu Nuclear Waste Storage Field. Tourists can enter its premises where a video will be shown inside a small room, on how the government processes the nuclear wastes, to prove to everyone that these radioactive materials won't leak into the environment. We don't know what would really happen in the future if Lanyu Island would turn into a dystopia. The Yami people can just pray to the heavens that someday these wastes would be taken out of their island. The town of Ivalino. Ivalino and Ivatan. Sounds familiar right? A flying fish is seen here in the town marker of Ivalino. The map of the town of Ivalino. The area on the right is where the underground houses of the Yami people can be found. The Yami house or "vahey". Words like "manok","apoy" and "vanga" which means chicken, fire, and earthen jar in the Filipino language are part of the Yami vocabulary. These words are also pronounced the same in my country. For the Filipinos reading this post, can you understand this Yami phrase "dengdengan so manok o vanga"? Haha! The consonant 'v' just like the word Ivatan was very common to the language of the Yami. 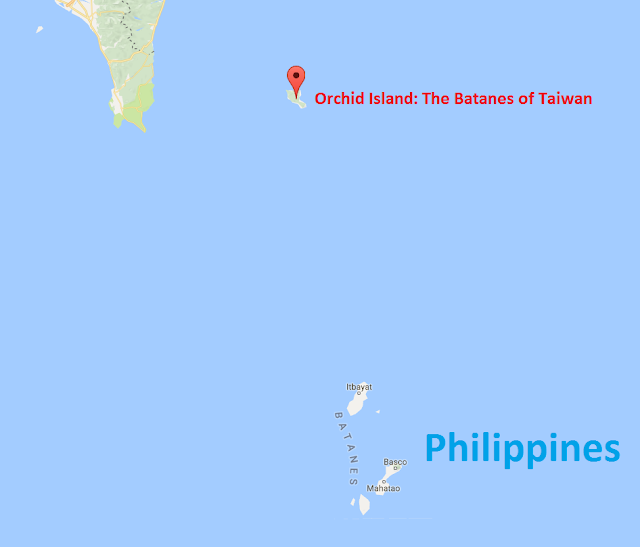 Orchid Island's aboriginal people speak the same language of the Ivatans of the Philippines and it was not surprising to be in a town that has the 'v' on its name. Welcome to the tribal town of Ivalino where the houses that you can find here were built underground. The homes were not really buried and the structures were constructed in deep trenches as an engineering solution against the powerful typhoons that crosses the Bashi Channel. They call their houses “vahey” similar to the way Filipinos called their homes "bahay". Getting close to these houses was a bit awkward because the homes were not really tourist attractions but private properties so getting inside would mean a violation of the owner's privacy. The tatala is considered sacred by the Yami people. On the blade of the paddle are two circular images which represent the sun while the drawing in between represents a human. According to scholars, the Yami doesn’t belong to any language group in Taiwan but it's rather classified as an Ivatan language. Hence, the possibility of an Ivatan (Filipino) and a Yami (Taiwanese) to understand each other is most likely even if they haven't met each other in their entire lives. But the two ethnic tribes still have some cultural differences, even though their language binds these two groups of people. Yami's “vahey” is one proof of these differences. While the Ivatans built stone houses with cogon roofs and narrow windows, the Yami built their houses below ground level as a protection against typhoons. Both aboriginal groups have a deep connection to the sea, but the Yami people in my opinion were more expressive when it comes to their fishing traditions. Orchid Island's people paint their boats called “tatala” with images of humans and eye while the boats of the Ivatan don't have these kinds of decorations. Just like in Batanes, the Yami people catch flying fish. They called the fish locally as "alibambang". The Yami boatmen with the tourist in their tatala as they sail across the sea. After cycling uphill on the road, I was suddenly surprised by the number of tourists here. There was a cave here and I tried to know what's inside. It turned out that I will exit at the seaside road at the point before I started my cycle uphill. A snake passes by while I was cycling on the road! Speaking of the boats, I came across the tribal town of Iranmeylek where tourist can get a chance to ride a wooden boat of the Yami. I really wanted to try but I felt that I wouldn’t be able to finish my biking activity before the sun sets down. Anyway, I took a video and watch the tourists as they were taken by skilled Yami boatmen into the open sea. Taro plant or "ahakawan" in the Yami language. In the Philippines, this is called "gabi". There is an interesting story about this photo. While I was cycling, I suddenly heard the voice of Freddie Aguilar playing on the radio. I searched for the origin of the sound and I found two farmers planting taro and beside them was their radio. I asked them if they were Filipinos and to my surprise, they were not. The farmers that I asked were Yami people and they were listening to the Filipino song "Anak"! I reached the town of Iraraley. I have seen beautiful rock formations like the dragon's head rock near the nuclear storage facility and the battleship rock as I cycled around Lanyu. I admired this natural landscapes especially as the rays of a setting sun strikes turning into yellow or orange in color. The sunset that I saw in Orchid Island was the best that I've seen in Taiwan and seeing this scenery also meant a bad omen in my adventures because I had observed that some portions of the Orchid Island's seaside road don't have any lamp posts making it dangerous for me to cycle when it gets dark. My bicycle also doesn't have any headlights. Oh no! The wild goats on their most dangerous rock climbing activity. Haha!